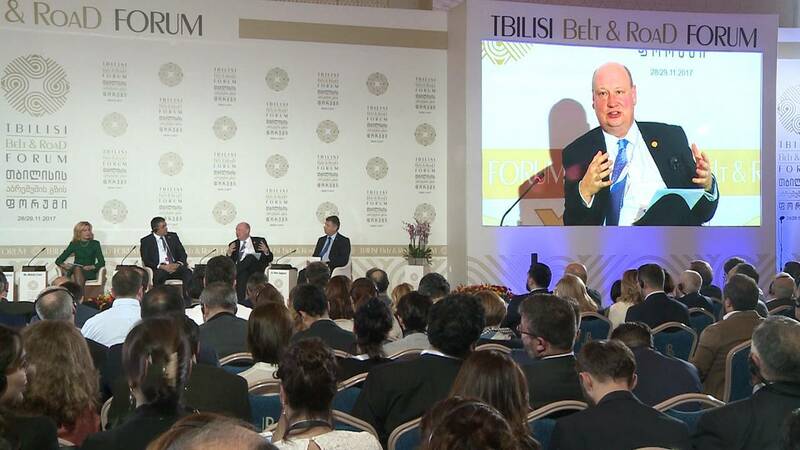 The Georgian capital Tbilisi has been playing host to the Belt and Road Forum drawing hundreds of delegates from around the world. Georgia can become a logistics, trade and transit hub for this region. Comprising both overland and maritime routes, the Chinese-backed initiative aims to revive and expand exchange between China and Europe along the ancient Silk Road. Georgia’s position along the way is strategic. A new 185 km-long East-West Highway is due for completion in 2020. And the Black Sea seaside resort of Anaklia is being turned into Georgia’s first Deep Sea container port capable of accommodating high-value cargo, with an overall capacity estimated at 100 million tonnes. “We are ready to start construction by the end of this year, so by 2020 we will finish the first phase of the port and by 2021 we will be officially receiving the Panamax and Postpanamax ships,” Ketevan Bochorishvili, CEO of JSC Anaklia City, told Euronews. Among other deals, a memorandum on the construction of a free economic zone was signed by Georgian and Chinese leaders. The goal is to draw Chinese investors to major projects like the Anaklia Free Industrial Zone, which will be built next to the port. “We have the Free Trade Agreement with China, but at the same time we have the free trade agreement with the European Union, with CIS countries and with Turkey. With an open economy and with the big markets which we are creating from these free trade agreements, we will be able to attract investors to our country,” said Dimitry Kumsishvili, Georgia’s First Vice Prime Minister and Minister of the Economy and Sustainable Development. Georgia is the only country in the region which enjoys free trade agreements with both the European Union and China – an invaluable asset to attract foreign investors according to analyst Anil Gupta of the University of Maryland. “Georgia, in terms of corruption, ranks among the least corrupt countries in the world, in terms of ease of doing business, so I think that overall Georgia is well set to attract foreign investment,” he told Euronews. Launched in October, the new Baku-Tbilisi-Kars rail link, which runs through Azerbaijan, Georgia and Turkey, brings the journey-time between Europe and China down to two weeks instead of 45 days. According to the European Commission’s Director-General for Mobility and Transport, Henrik Hololei, this Belt and Road plan has many advantages for Europe. “Obviously we will benefit from that, it will generate economic activity, we hope that it will also generate more trade and more people movement, and I believe that it is in the interest of Europe and of China, and of all those countries along this route,” he said. In Georgia, some businesses are already making plans to expand. We visited a leading wine company that exports 10 million bottles annually to Europe, China and members of the CIS. Its CEO is convinced the modern Silk Road will generate more business. “Europe, Asia and our little country of Georgia in between. I think this is the beginning of a new economy. This is the route that will give us the opportunity to change the dynamics,” said Zurab Chkhaidze, CEO of Kakhetian Traditional Winemaking. With its strategic location along the new Silk Road and competitive market, Georgia is intent on carving out its share and restoring its position as a major regional hub between East and West.